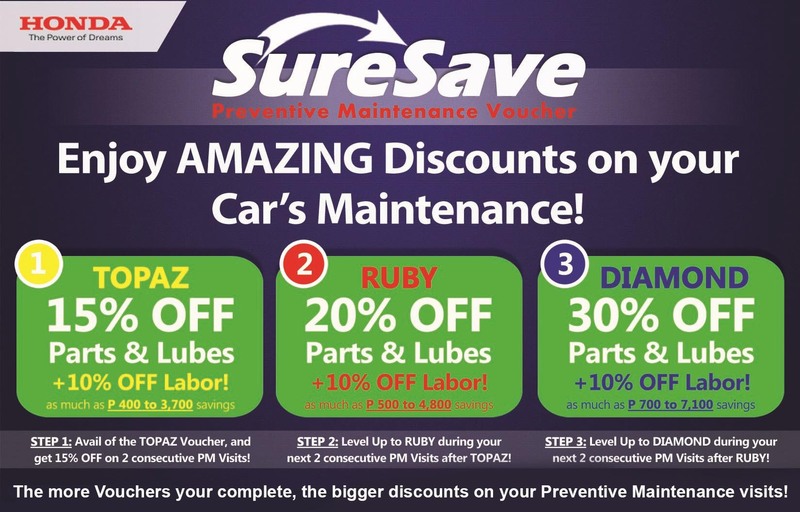 Transferable at no cost and refundable at minimal cost, this extended warranty is aimed at giving our valued customers peace of mind, protection from unexpected repair expenses, quality service and genuine parts, and increase in resale value of vehicle. The Honda PROTECT PLUS Extended Warranty has the same coverage, exclusions, and owner responsibilities with the standard warranty. It is available for purchase for all buyers of any Honda vehicle. Buyers may purchase it together with their new Honda vehicle, or at any time within 30 days (or their 1,000KM check-up whichever comes first), or from the release of the vehicle. 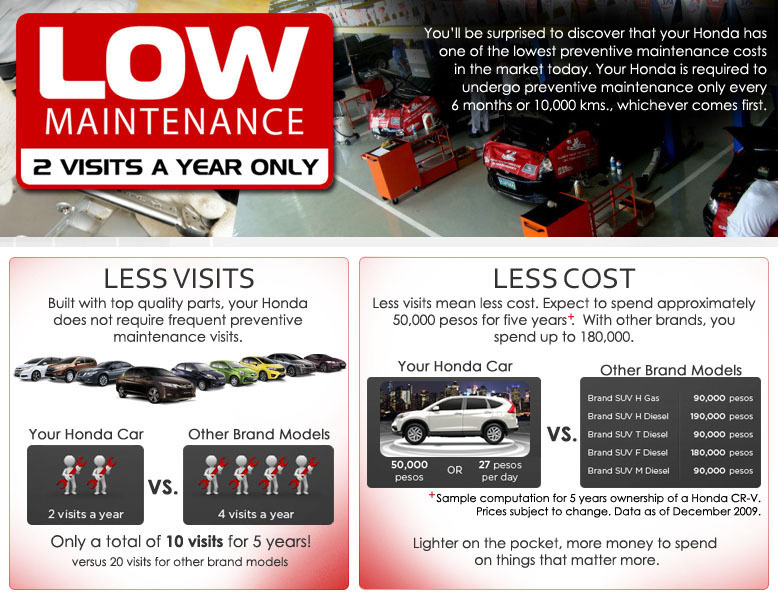 Note: Honda PROTECT PLUS Extended Warranty is an optional purchase. Honda Plus is initially available at brand new car purchase only. 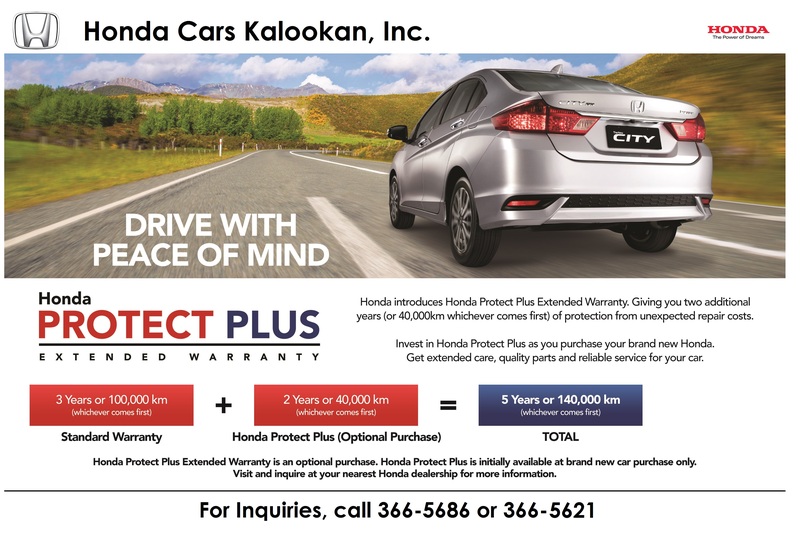 Visit and inquire at Honda Cars Kalookan, Inc.
After two more consecutive PM visits, get a DIAMOND Voucher with 30% discount on Parts and Lubes and 10% discount on Labor for two (2) consecutive visits. 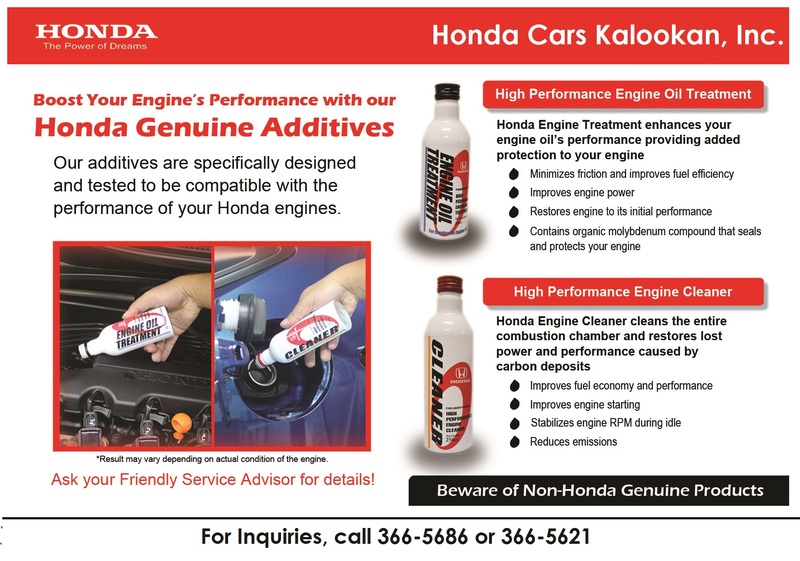 Honda Cars Kalookan, Inc. personnel from the mechanics to service advisors are well trained. Under strict supervision by Honda's engineers we make sure that only qualified people handle your precious vehicles. We take care of your Honda's like we take care of real people. 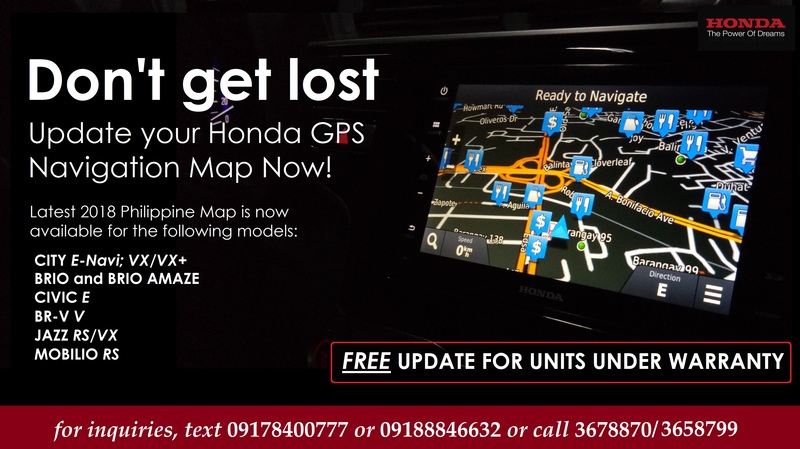 Note: Please bring your car to Honda Cars Kalookan, Inc. on the scheduled time and date. Kindly remove all unnecessary/personal items from your car. One of the most important component in body repair and restoration, is paint. No less than PPG of America and Standbox of Germany are our chosen paint suppliers. Both paint companies supply 2K Urethane Paint which is one of the most advance form of paint. 2K gives your car a high gloss finish and lasts long because it is more durable compared to the standard car paint. HCKI's Color Lab uses computerized color calibration and mixing system to mix paint. this gives precise color match and eliminates guesswork. Paint formulas stored in CD-ROM are updated anually on new colors. Our lab technician retrieves the formula and mixes paint using digital scale or accuracy up to the last gram. Since painting is an art, HCKI hired only the bes. Our painting staff has had extensive experiences in foreign countries and has worked in big companies such as BMW, GM and Mercedes Benz. Training is done on a regular basis in order to keep up with the latest in painting technology. We will save you a lot of time and effort since our LTO Liaison Officers will take care of registering your vehicle.All you need to do is visit us or call and we will register your vehicle at the Land Transportation Office (LTO). After securing your new registration, we will deliver it directly to your home or office. Protect your Honda and Drive with Confidence. Honda Cars Kalookan, Inc. offers Insurance Packages not only for new cars but also for those with existing Insurance Coverages which are due for renewal. Your car will be insured by Malayan Insurance Company, the country's No. 1 non-life insurance company and a sister company of Honda Cars Kalookan, Inc.
Repair, repaint & retouch scratches and chips to your car's body immediately. Corrosion usually starts at these unpainted, damaged areas. Have repaired and repainted portions of the car body re-rustproofed immediately. Have your car's underbody checked periodically. Dried up dirt or mud forming under your car's fender acts like a sponge during rainy days.These absorb rainwater which is a major cause of rust. Have a regular periodic car wash whenever situation warrants it. Avoid kerosene and chemicals in washing. Copyright © Honda Cars Kalookan, Inc. All rights reserved.